Soon after the sufferings on the Cross of the Lord Jesus Christ and after His Ascension into Heaven, there settled at Caesarea in Palestine a centurion by the name of Cornelius, who earlier had lived in Thracian Italy. Although he was a pagan, he distinguished himself by deep piety and good deeds, as the holy Evangelist Luke testifies about him (Acts 10:1). The Lord did not disdain his virtuous life and led him to the understanding of truth through the enlightening light of faith in Christ. By means of this vision the Lord commanded the Apostle Peter to go at preaching the Word of God to the pagans. When the Apostle Peter in the company of those sent to meet him arrived at the house of Cornelius, he was received with great joy and respect by the host together with his kinsmen and comrades. Cornelius on his knees bowed down to the apostle and requested to be taught the way of salvation. The apostle began to preach about the earthly life of Jesus Christ, about the miracles and signs worked by the Saviour, about His sufferings, the teachings about the Kingdom of Heaven, the death on the Cross, the Resurrection and Ascent into Heaven. By grace under the influence of the Holy Spirit, Cornelius believed in Christ and was baptised together with all his kinsfolk. He was the first pagan to receive Baptism. He retired from the world and went preaching the Gospel together with the Apostle Peter, who made him a bishop. When the Apostle Peter, together with his helpers Saints Timothy and Cornelius, was in the city of Ephesus, he learned of a particularly vigorous idol-worship in the city of Skepsis. Lots were drawn as to whom that would go there, falling upon Saint Cornelius. In the city lived a prince by the name of Demetrios, learned in the ancient Greek philosophy, hating Christianity and venerating the pagan gods, in particular Apollo and Zeus. Learning about the arrival of Saint Cornelius in the city, he immediately summoned him and asked him the reason for his coming. Saint Cornelius answered, that he came to free him from the darkness of ignorance and lead him to knowledge of the True Light. The prince, not comprehending the meaning of what was said, became angry and demanded him to answer each of his questions. When Saint Cornelius explained, that he serves the Lord and that the reason for his coming consists in an announcement of the Truth, the prince became enraged and demanded from Cornelius an offering of sacrifice to the idols. The saint asked to be shewn the gods. When he entered the pagan temple, Cornelius turned towards the East and bending down on his knees, he uttered a prayer to the Lord. There began an earthquake, and the temple of Zeus and the idols situated in it were destroyed. All the populace, seeing what had happened, were terrified. The prince was even more vexed and began to take counsel together with those approaching him, about how to destroy Cornelius. They bound the saint and took him to prison for the night. At this point one of his servants informed the prince the grievous news that his wife and child had perished beneath the rubble of the destroyed temple. But a certain while later one of the pagan priests, by the name of Barbates, reported that he heard the voice of the wife and son somewhere in the ruins and that they were praising the God of the Christians. The pagan priest asked to free the imprisoned one, as gratitude for the miracle worked by Saint Cornelius, in that the wife and son of the prince remained alive. The joyous prince in the company of those about him hastened to the prison, declaring that he believed in Christ and asking him to lead out his wife and son from somewhere in the ruins of the temple. Saint Cornelius set off to the destroyed idol-temple, and through prayer the suffering were freed. After this the prince Demetrius, and all his kinsmen and comrades accepted holy Baptism. 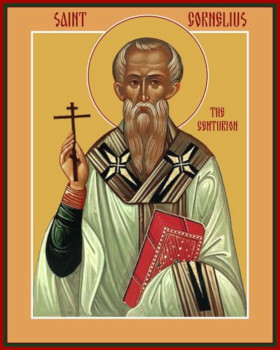 Saint Cornelius lived for a long time in this city, converted to Christ all the pagan inhabitants, and made Eunomius a presbyter for service to the Lord. Saint Cornelius died in old age and was buried not far from the pagan temple destroyed by him.